Douglas Feith Responds to Criticism Former Undersecretary of Defense Douglas Feith is under fire again. A new Pentagon report suggests that his office manipulated pre-war intelligence to heighten fears of a connection between Iraq and al-Qaida. The Senate Armed Services Committee is holding a hearing Friday on the report. Former Undersecretary of Defense Douglas Feith is under fire again. A new Pentagon report suggests that his office manipulated pre-war intelligence to heighten fears of a connection between Iraq and al-Qaida. The Senate Armed Services Committee is holding a hearing Friday on the report. From the studios of NPR West, this is DAY TO DAY. I'm Alex Chadwick. And I'm Madeline Brand. Coming up, Anna Nicole Smith's biggest legacy, legal trouble. CHADWICK: First, there is another report today on the intelligence failures that led the U.S. into the Iraq war. This one is from the Pentagon. It says a former top official there presented misleading reports to President Bush and Vice President Cheney and others. That official is the former undersecretary of defense, Douglas Feith. We'll hear from him in a moment. Here is Senator Carl Levin, the chair of the Senate Armed Services Committee, which is releasing a declassified version of the report today. The senator is speaking to the inspector general of the Department of Defense, Thomas Gimble. Senator CARL LEVIN (Democratic, Michigan): Without the knowledge of the intelligence community, we have a alternative intelligence analysis being presented on war or no war issues, whether or not the people who attacked us on 9/11 had a connection to Saddam Hussein. 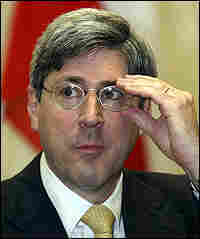 CHADWICK: Former Undersecretary of Defense Douglas Feith, thank you for agreeing to come back on DAY TO DAY. And what would be your response to Senator Levin? Mr. DOUGLAS FEITH (Former Undersecretary Of Defense): Well, what he's saying is wrong and unsupported. The criticism that is being directed now at my former office is because my office was trying to prevent an intelligence failure. We were - we had people in the Pentagon who thought that the CIA's speculative assessments were not of top quality. They were not raising all the questions they should raise and considering all the information they should consider. And our people criticized the CIA. And they did not present an alternative intelligence analysis. They presented a criticism. And now the inspector general is saying that criticizing the CIA was an intelligence activity that policy people should not have engaged in. CHADWICK: That's not what he's saying. He's saying you briefed the president and the vice president and you said that there was conclusive evidence that there was an alleged - that there was a meeting between the 9/11 hijacker Mohamed Atta, and an Iraq spy in Prague. That was doubtful then. It's pretty much discredited now. Mr. FEITH: No. That's absolutely not true. I mean what you're saying is just - there are about, you know, a dozen factual errors in your question there. It's just not true. Firstly, I didn't brief - I mean that's part of it - but in the - there were some people from my office and people from elsewhere in the Pentagon who were challenging the CIA's assessment of the Iraq/al-Qaida relationship. And they were raising questions and they were not putting out their own conclusions and analysis. They were challenging the approach that the CIA took, because they believed that the CIA had a theory that ideological opponents, like secular Baathists in the Iraqi government and religious extremists in al-Qaida, could not cooperate for strategic purposes. And the critics in the Pentagon of the CIA said that the CIA was filtering its own intelligence and ignoring its own intelligence that was inconsistent with the CIA's theory. CHADWICK: What the inspector general's report says is that your office presented findings which appeared to be based on a full reading of intelligence and they were not based on a full reading of intelligence. Mr. FEITH: That's simply not correct. And I don't believe that's what the inspector general report says. I mean there's an enormous amount of loose talk about this and vague and loose allegations. And it's really - it's very difficult to refute stuff that is so, you know, so thoroughly inaccurate. The point here is there was an intelligent, professional criticism made by policy people of - let me just specify here. Mr. FEITH: When this very issue was looked at by the Senate Intelligence Committee in their bipartisan unanimous report in July 2004, they said that this very activity improved the CIA's work. CHADWICK: Let me read to you from a statement and executive summary put out today by the Pentagon. It says that your office, quote, "developed, produced and then disseminated alternative intelligence assessments on the Iraq and al-Qaida relationship which included some conclusions that were inconsistent with the consensus of the intelligence committee and you presented these to senior decision makers." Mr. FEITH: Okay. It is true that we put out questions and ideas that were inconsistent with the consensus of the intelligence community. That is not a crime. That was criticism. By the way, it is clear from both the Senate Intelligence Committee and the Silverman-Robb Commission reports that the government is better off if we have more and not less policy people raising serious challenges to intelligence. Mr. FEITH: As you pointed out, there were serious intelligence errors as we went into Iraq. Mr. FEITH: There should've been more questioning, not less. CHADWICK: That again is a position that the inspector general seems to disagree with quite sharply. He concludes that a basic problem was that you were a policy person. You were formulating and advocating for a policy that you thought was the right thing to do, in this case the war in Iraq. And then you are presenting reports from your office that present themselves as neutral intelligence analysis when they're not. Mr. FEITH: Yeah, well, that - that's not correct. And I don't agree with the inspector general on the point that the criticism of intelligence is intelligence work. I mean it's an interesting thing. Senator Levin and Senator Rockefeller had severely criticized the CIA. Now, when they criticize the CIA, is that intelligence work improper for non-intelligence people to do? Mr. FEITH: - that intelligence people should not be allowed to raise questions about - policy people should not be allowed to raise questions about intelligence. CHADWICK: Douglas Feith, now a visiting professor in the School of Foreign Service at Georgetown University in Washington. We'll sure hear more from you today. And thank you so much for coming back on DAY TO DAY. Mr. FEITH: Good to talk to you. CHADWICK: You can find the executive summary of that Pentagon report at our Web site, NPR.org.